Dr. Eric L Grossman received his education and training at Syracuse University Newhouse School of Communications, Columbia University, Jefferson Medical College, Thomas Jefferson University and the world–renowned Rothman Orthopaedic Institute. As Director of Total Joint Arthroplasty at The Rothman Orthopaedic Institute - New York, he has published research in the field of total joint arthroplasty, and performed approximately 5000 total joint replacements. Dr. Grossman has performed over 3000 anterior total hip replacements allowing patients to recover faster, and return to their lives more quickly. Dr. Grossman has been a longtime advocate of the benefits of recovering safely and effectively from total joint replacement surgery in the comfort of home. As a supporter of ambulatory, or same day total joint replacement, where the patient has their surgery and then returns to their home the same day. Dr. Grossman’s team at Rothman Orthopedic Institute have developed a team approach pathway allowing for same day total joint replacement to be successful for the right patient. Dr. Grossman is a believer in advancing robotic technology, and its ability to increase surgeon accuracy, patient outcomes and experience. The robotic technology available to us today is truly an additive support to the surgeons armamentarium, while still allowing for the surgeon to be in control and provide his or her expertise, particularly in partial and total knee replacement surgery. Robotic and minimally invasive techniques can allow for knee replacement to be highly successful, while allowing for a potentially speedier recovery. Dr. Grossman’s goals for his patients are for them to be vastly better than they were before surgery, and allowing for them to return to a vivacious, physical, experience rich, and active life. Many of his patients after total hip and knee replacement, return to hiking, skiing, tennis golf, yoga, and many other activities. 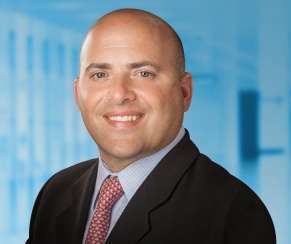 Dr. Eric Grossman is a member of the Mount Kisco Medical Group and is Director of Joint Replacement Surgery at the Orthopedic and Spine Institute. The major advantage of the anterior approach to hip replacement is the fact that muscular tendons are not detached. In other approaches, tendon detachment and splitting are unavoidable. Because the anterior approach spares major muscles and tendons, patients are at low risk for hip dislocation and therefore can regain mobility more quickly, and without following the restrictive hip precautions prescribed for the other hip surgical approaches. 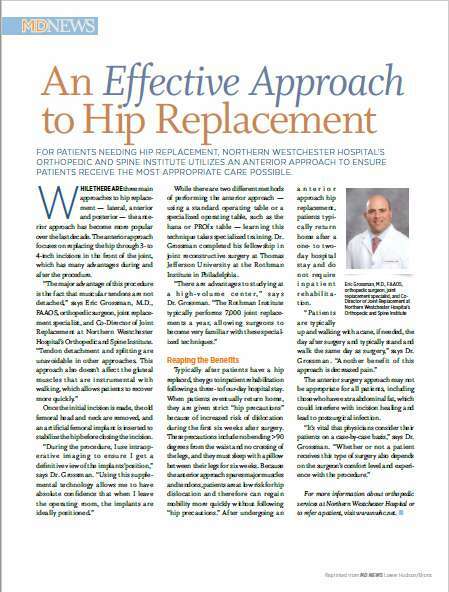 Dr. Grossman describes the procedure and benefits of the anterior approach to hip replacement in MD News. Dr. Grossman specializes in the Anterior Total Hip Replacement.